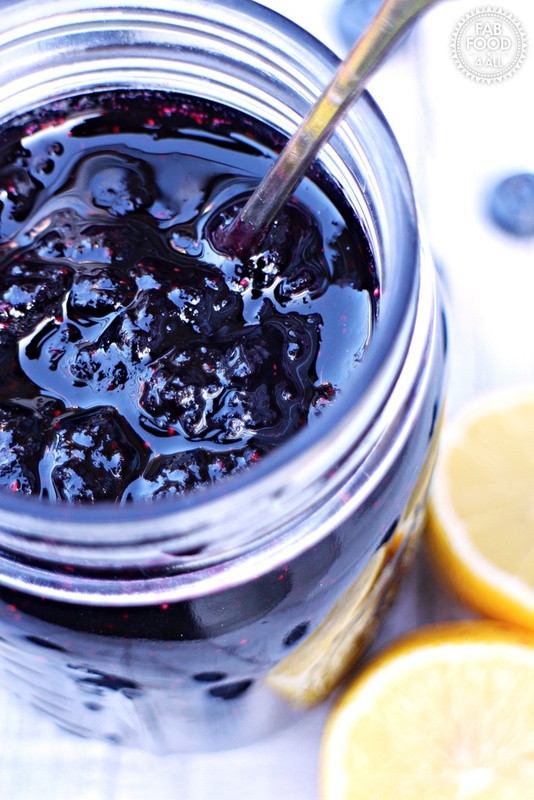 You are here: Home / Jam / Simple Blueberry Jam – no pectin, just 3 ingredients! 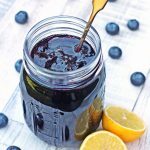 Simple Blueberry Jam – no pectin, just 3 ingredients! I have never made blueberry jam before but I’m thrilled to bring you my Simple Blueberry Jam recipe today after a freak bargain find at the weekend! I managed to find 4 trays of blueberries priced up at £3 each for 3 p each, there was a whole crate that were on their sell by date. We ate one tray but the rest were destined for jam, although I did have to throw away just over a third of the remainder as they were soft and over ripe which is not good for eating or jam making. However, I’m really not complaining at that price, I’ve never seen blueberries so cheap nor so many of them reduced before! I can’t remember the last time I had blueberry jam! But I have never had home-made! 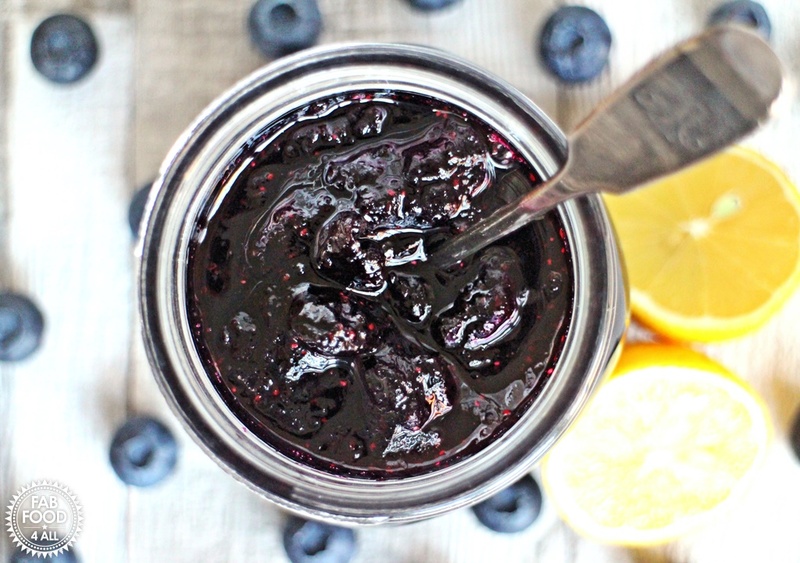 I can’t tell you how amazing this Simple Blueberry Jam is. The depth of flavour is just incredible and totally delicious. I was reading about the pros and cons of pectin use in jam the other day and the point was made that although by using pectin you achieve a shorter cooking time and a slightly higher yield, you don’t get the intensity of flavour that you get with a longer cooking time where more moisture is evaporated away. 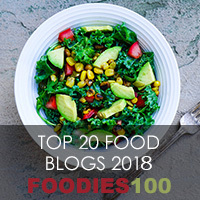 I had never really thought about this before as I never use pectin or jam sugar in my recipes (well apart from my first ever jam where I used jam sugar but I didn’t like the stiff texture and looking back the flavour was not a patch on my One Punnet Strawberry Jam which just uses lemon juice to aid the setting. 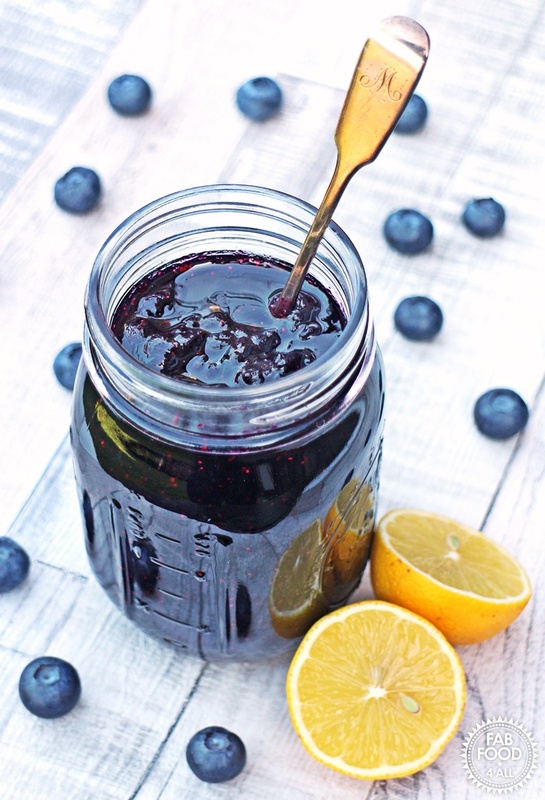 Blueberries are naturally low in pectin so apart from using only the firmest just ripe or slightly under ripe fruits you need to add pectin or lemon juice which aids the gelling process by interacting with the sugar. If you’ve never made jam before it’s never too late to learn, I only started making jam in the last 4 years and just got hooked. The important things are to sterilise your jars, freeze some saucer for testing and always stir your jam or you will burn it to the bottom or your pan. If you get the set too runny you can always pour back your jam and boil it up again until it reaches setting point (you get better as judging this as time goes on but I’ve only ever got it wrong once as I like a soft set jam but I pushed the boundary a bit far that time). If you grow your own blueberries or ever see a bargain like mine then I do hope you try my Simple Blueberry Jam which makes one good sized jar but you can always scale the recipe up to make more if you have more! 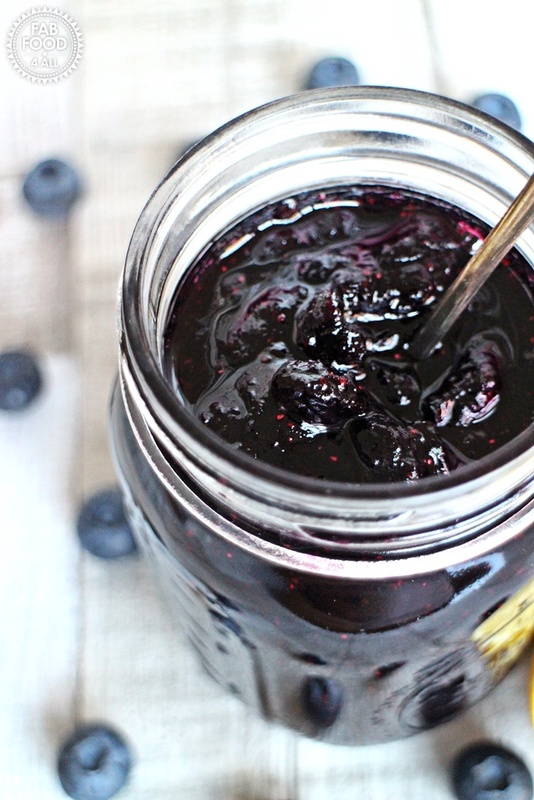 Simple Blueberry Jam - no pectin, just 3 ingredients! Wash the blueberries in a colander. Put the blueberries, sugar and lemon juice into a preserving pan. Place the pan over a gentle heat to slowly dissolve the sugar crystals, stirring with a wooden spoon from time to time. As the sugar starts to melt and the fruit warms up, take a potato masher to mash the blueberries, leaving some whole if desired. Once the sugar has completely dissolved turn up the heat and bring the pan to a rolling boil and time for 15 minutes, stirring all the while (to prevent the sugar burning on the base). Take the pan off the heat and test a few drops of the jam on a frozen saucer and place in the fridge for a minute. If when you push your finger through it the jam forms a crinkle and is gel like then it’s ready. Otherwise boil for another couple of minutes and repeat process until ready. 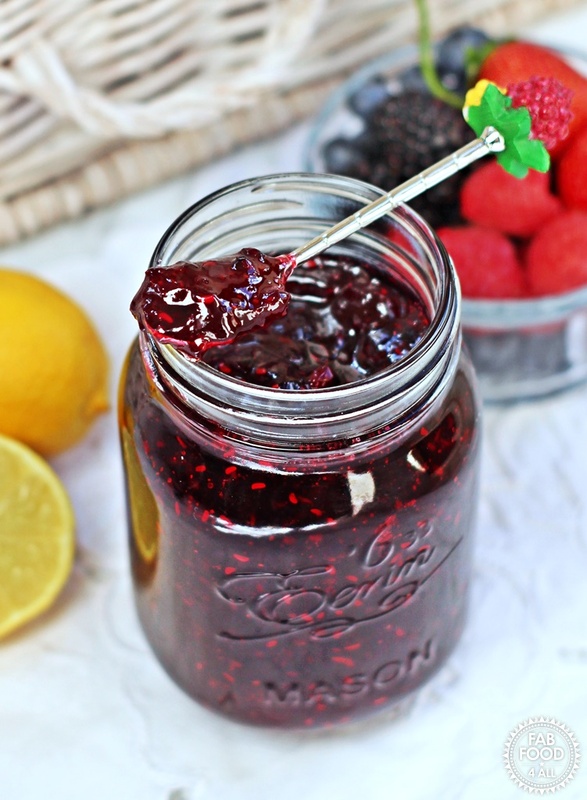 Pot up the jam in a sterilised hot jar using a small ladle or jam funnel. Sterilise 1 x 450 ml jar by washing in hot soapy water or take straight from dishwasher, filling with boiling water, emptying and then placing in oven for 20 minutes at 140°C then leave in oven until jam is ready. Washed lids should be sterilised with boiling water and then left to drain. Previous Post: « Italian Minced Beef Plait – so quick & easy to prepare! Hi Yvonne, thank you so much! 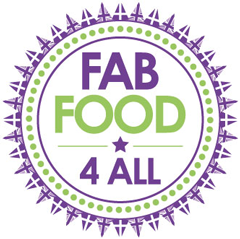 I don’t use or eat anything with artificial sweeteners but sugar is needed in jam to preserve it. I once made a chia jam with Stevia (after being sent a sample) as an experiment it just tasted of sweetener to me and it went in the bin. Made this and it was so easy to make. My family loves it. This is great does it need to be stored in the fridge once its ready or just in the cupboard???? Hi Julie, unopened you can store this jam like all my jams in a cool, dark place (jam can keep for years but best in first year) and once opened store in the fridge and use within 2 – 3 months. Made this today. It was so simple to make and a quick taste of the tester ‘sacrifice’ shows a lot of promise. I made it with the blueberries that were left over from making blueberry gin. Win – win.